The cirrocumulus floccus clouds belong to the cirrocumulus category of clouds. The cirrocumulus floccus produces a vigra, which is a precipitation that evaporates once again before it reaches the ground. This is the reason why the cirrocumulus floccus clouds do not fall as rain or snow very often. 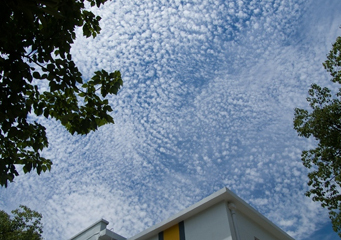 What height are cirrocumulus floccus clouds found? They occur at an altitude that is above 16,000 feet, but well below 39,000 feet. Their high altitude makes them very cold clouds and, in fact, the water droplets that have already condensed form into snowflakes. This doesn't always mean, however, that their presence will mean an imminent snow. What do cirrocumulus floccus clouds look like? What are cirrocumulus floccus clouds? These clouds are indicators of instability in the atmospheric level. In that way, they are the same as the cirrocumulus floccus castellanus. As a matter of fact, the floccus can form from a castellanus and vice versa. The castellanus is an evolutionary state of an original cloud to a different cloud type that will indicate instable atmospheric levels. Since the castellanus often form at the base of an original cloud that has dissipated, this is also how a floccus may form. It's important to note that there are many subspecies that belong to the cirrocumulus cloud type. It should be noted, too, that there are other clouds of different types and altitudes that will resemble the appearance of the cirrocumulus floccus. This is one reason why many people get confused with how the floccus looks. This causes confusion not only in looks, though. It also causes confusion in the way people can predict the weather by the presence of cloud types. Among the cirrocumulus clouds, which are fairly tempered clouds; this is one that might mean weather problems. The fact that they produce virga, the rain that evaporates before it falls, doesn't signify that the cirrocumulus floccus will not cause bad weather. To be safe, it's important to pay attention to the cloud types. A person who is trying to predict weather by looking at the clouds can do so by first characterizing the cloud features, and then the possible altitude, and finally the cloud type. Doing so will allow that person to best classify what type of cloud is in the sky. After careful assessment of the cloud type, and if it turns out to be a floccus, you should consider preparing for less than favorable weather. While this cloud itself doesn't produce rain, it might be an indicator of other types of bad weather clouds moving in sooner or later.